Crews headed out to the fire this morning to build and improve fireline; search for heat along the fires perimeter; use air resources to haul water as needed; mop-up; and patrol around structures. Fire activity yesterday was minimal with creeping and smoldering. An infrared flight flew the fire last night discovering areas of heat that the crews will go and investigate and extinguish as needed. As firefighters and law enforcement assessed the Horseshoe fire on Wednesday the situation emerged as a mixed blessing. 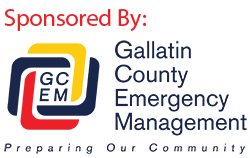 The Department of Natural Resources and Conservation’s (DNRC) County Assist Team and the Gallatin County Sheriff’s Office have identified approximately twelve structures that burned during the initial night of the fire. Structure loss includes: three primary residences; two secondary residences; and seven outbuildings. In the chaotic first hours the fire burned around and among approximately 40 structures. The efforts of homeowners, local volunteer firefighters, and the DNRC paid off, as many of the yards of homes and cabins are islands of green in a sea of black. Local fire engines arrived, were soon joined by a DNRC helicopter, and firefighters began to assess priorities for the fire. Most importantly, the firefighters fulfilled their most critical mission; no residents, firefighters, or members of the public were hurt. The fire was well established when firefighters arrived on the scene late on Monday afternoon. Through quick communication and reliance on the Incident Command System the diverse firefighting resources converged on the scene and made a plan – stay safe, keep the public safe, and try to keep the fire away from homes and structures while watching each other’s’ backs. EVACUATIONS: Currently there are no evacuations or closures in place.